Which pairs or groups of photos in the presentation could be used to demonstrate ideas for argument writing topics about education, technology, food, family, work, leisure, health, advertising etc? 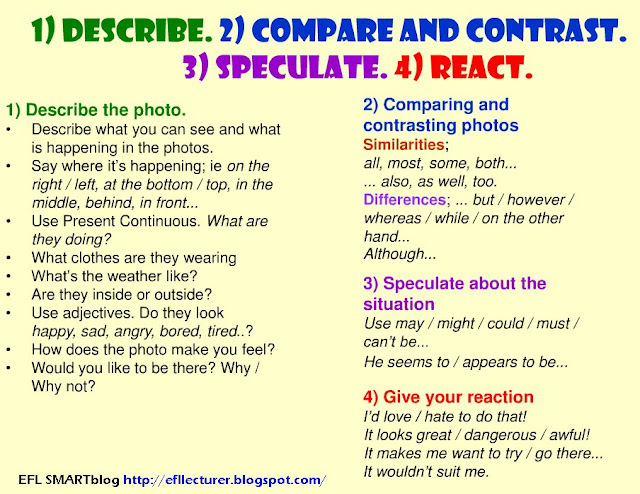 Really nice presentation to help students describe and contrast photos which is a skill they need in many exams. Excellent blog as well. Thanks for your comments, Kieran. As someone who uses a lot images in my regular teaching, this lesson is superb! Thank you - and thank you for the best teaching/learning blog for ELT! Thanks Cristina. Glad it's useful! I'm really new to blogging. This is a really interesting blog with a lot of interesting things. Great work and thanks for sharing. Thanks for your comment Melen@. Glad you like it! Hi, David! This is very good as a motivation piece for IELTS writing. It's also a good way to learn comparative vocabulary which will be used for IELTS speaking. I hope you can feature more lessons like this. Cheers! Hi Ana, Thanks very much for your comment. More to come soon ( I hope) :) Cheers! I love this slide show! I appreciate all the hard work you put into this! It's user friendly & provides many opportunities for language practice! Thanks for posting Xavier. I'm very pleased it's useful. Hi David! Thanx a lot for this short and simple instruction. I'll definitely use it at my lessons. I love this site for teaching my ESL students. Wonderful work! Wonderful teaching hints. Thanks a lot and greetings from Italy. Many of the interactive exercises now don't work. This is because dropbox has disallowed embedding. After March 15th 2017 all links on this blog will cease to work. This is because dropbox has decided to disable public links. Talking about Music - Why do we listen to music? Hi! How are you? Post a quick message here! Click on the picture to post a message on the EFL SMARTblog message wall. EFL SMARTblog by David Mainwood is licensed under a Creative Commons Attribution-NonCommercial-ShareAlike 3.0 Unported License. Your Own Book Shop for a Week- Read, listen and learn a little English! EFL SMARTblog. Awesome Inc. theme. Powered by Blogger.